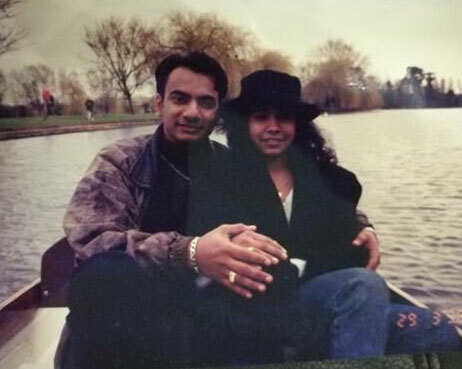 Cupid’s arrow has struck many times over the years at Coventry University and since it’s Valentine’s Day and love is in the air, we caught up with some former students to find out more about how they met and life since university. In 1995, Vignesh came to Coventry from Kuala Lumpur in Malaysia to study Business Administration followed by a Master’s in Business Administration. He was on an overseas transfer programme from INTI International University and Colleges in Malaysia. He remembers seeing his now partner Sara from a distance in the cafeteria in Priory Hall soon after arriving in Coventry. Vignesh says he was dumbfounded and lost for words when she came over to say hello. “She just told me “you look so familiar, have we met before?” I lived in the northern state in Malaysia and she lived in the southern state. It was truly shocking as the feeling was mutual of having met somewhere before and even till this day it’s an unsolved mystery but, simply put, destiny”. Sara did an advanced diploma and got direct entry into the second year for the undergraduate Business Administration course in 1996. Sara was a year behind Vignesh who was in his final year. He continued to do his Master’s while she was doing her final year. Sara recalls feeling lost as it was the first time away from her family. She said she was very shy back then and would not normally introduce herself but the meeting in the cafeteria was the start of their friendship. After graduation Vignesh and Sara moved and settled in Kuala Lumpur before getting married four years later in 2000. Soon after they welcomed their two sons, Rasheevan who is 14 and Haressh who is 12. 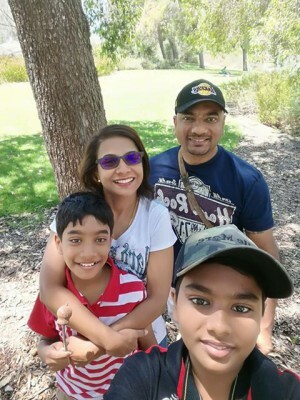 Vignesh currently works away in Budapest, Hungary on a semi-permanent basis for the United Nations High Commissioner for Refugees so he and his family keep in touch daily by video call. 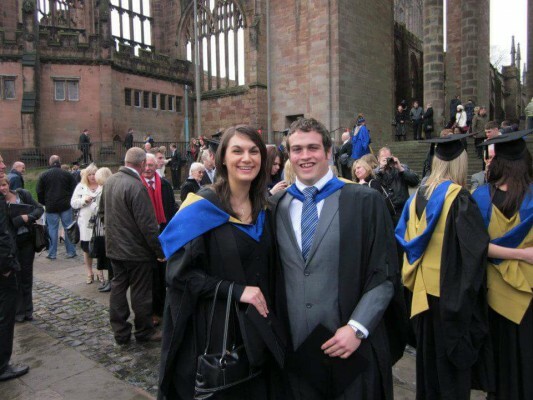 Rosie came from Barking, London to Coventry in 2006 to study Geography and Simon came from Stratford-upon-Avon, starting his Geography degree a year later in 2007. Rosie was Vice President of the geography society and was giving a talk at one of Simon’s lectures when she met him. They later got to know each other better at a Students’ Union quiz night. Rosie graduated with Simon in 2010 after retaking a year. They moved in together and got married in 2014. They enjoy travelling and decorating their house in Warwick. 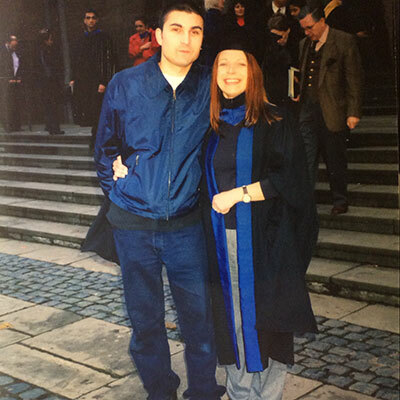 Originally from Nuneaton, Rachel came to Coventry in 1994 to study Environmental Science as a mature student. Carlton came from Elstree, Hertfordshire and was enrolled on the same course. The pair met in the Students’ Union after some friends got them together for drinks. After much encouragement they got talking and had their first date in the same week at The Junction. “It was a time of great change for me. As a mature student I had returned to education after eight years at work. Meeting Carlton, who was much younger than me, was a really important part of that new start. Who knew it would last this long?” said Rachel. Rachel and Carlton moved in together in their first year. They graduated a year apart and now live in Finham, Coventry. Their five year old son Billy was born in 2012. Michael came from Rochdale to study Business Enterprise at Coventry in 1998. Laura was from Sleaford, Lincolnshire and started a course in Occupational Therapy the same year. They were introduced by a mutual friend in the Golden Cross pub. 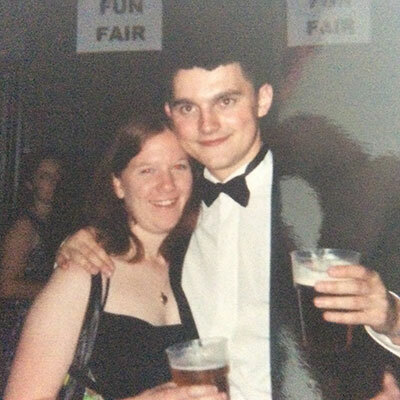 “We had lots in common which helped, and soon became an item and have now been together nearly 20 years” Laura said. 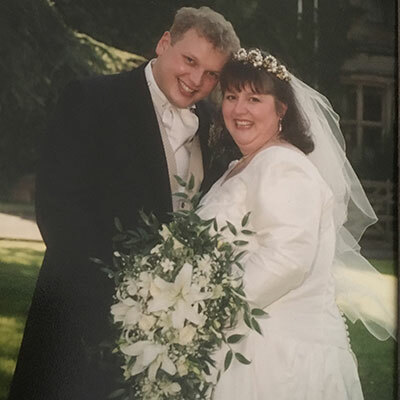 Michael and Laura were married in 2006 and now live in Lincolnshire after graduating in 2001. Their daughter Katherine came along in 2015. They are expecting their second child this year. Daryl came to Coventry to study Computer Studies in 1984 from Great Gonerby, Lincolnshire. Mark, from Welham Green, Hertfordshire, was on the same course. They met in student accommodation and discovered they were on the same course. With many shared interests they made friends quickly and got together just a few weeks after meeting. “I noticed Mark’s lovely blue eyes immediately and had a feeling that this man was going to be special in my life” Daryl said. 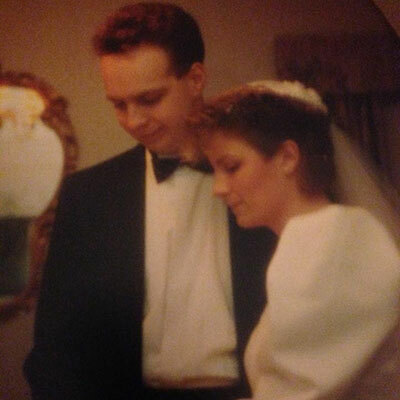 The pair graduated in 1986 and married three years later. They settled in Nuneaton 28 years ago and now have two daughters, Rebecca who was born in 1992 and Abigail who arrived in 1996. Daryl and Mark are looking to retire to the coast within the next few years. Jon came to Coventry from Derby to study Applied Chemistry in 1990. Alison also studied the same course and came from Bridgend, South Wales. They became friends after meeting at a house party on Chevral Avenue in Radford. 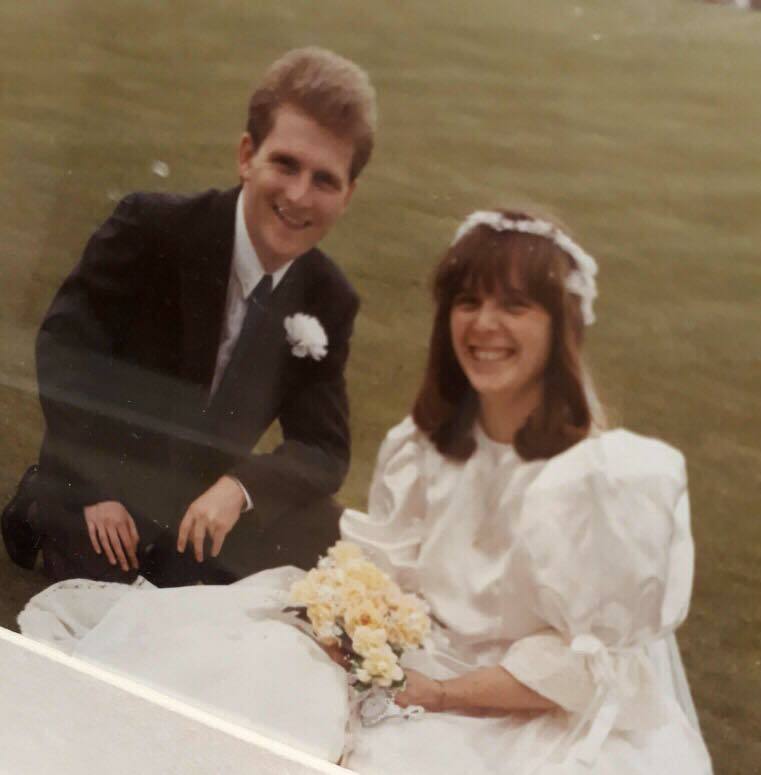 Jon and Alison got engaged at their graduation ceremony in November 1993 before finding jobs in the chemical industry, local to Coventry. In 1994 they bought their first house and their first child Eveline was born in May 2004. They settled in Derby and had their son Seth in 2008. Graham came from Grimsby to study Graphic Design in 1981 and Jenni came from Liverpool to do a HND in Physical Sciences. They were both involved in the Students’ Union, Jenni as general secretary and Graham was on the entertainment committee. They were both punks and officially met at a ‘Chelsea’ concert. The couple got married in 1987 and settled in Warwickshire before having their four children. Both Jessica and Peter were local to the University coming from Rugby and Coventry to study Physiotherapy in 2008. They got to know each other at a course meet and greet during fresher’s week. “We were really good friends and I spent three years waiting for Pete to ask me out! At graduation in November 2011 my dad thought he saw something between us, so he invited Pete to our graduation meal with my friends and their parents! As much as I don’t like to admit it, my dad is probably the reason we are where we are giving us the push we needed” said Jessica. Jessica and Peter settled in Dorset and tied the knot in 2015 before welcoming their baby girl Gabriella in 2017. 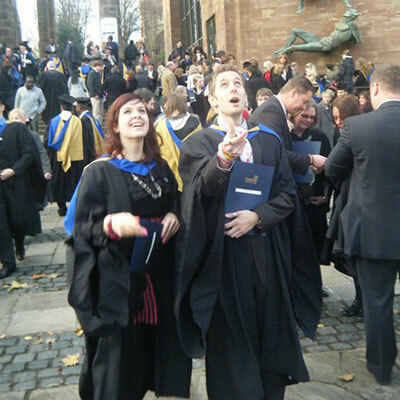 Are you Coventry alumni who would like to share your story with us? You can comment below and the UnCOVered team will be happy to share the love! ← Flippin’ Fantastic Pancake Day Fun!